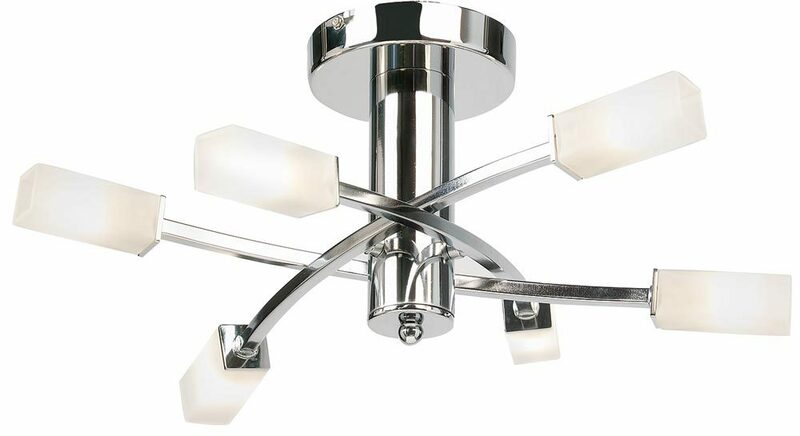 The Havana modern polished chrome semi-flush 6 light fitting features a minimalist look; acid glass shades and is a great lighting choice for rooms with a low ceiling. Circular ceiling mount and short thick drop rod finished in polished chrome, with three square section overlapping horizontal lamp arms tipped with a square acid etched glass shade at both ends. A modern semi-flush ceiling light with square section arms on a round back plate, complete with square acid etched glass shades. The polished chrome Havana range includes a matching three-light semi flush and double switched wall light, please see below.